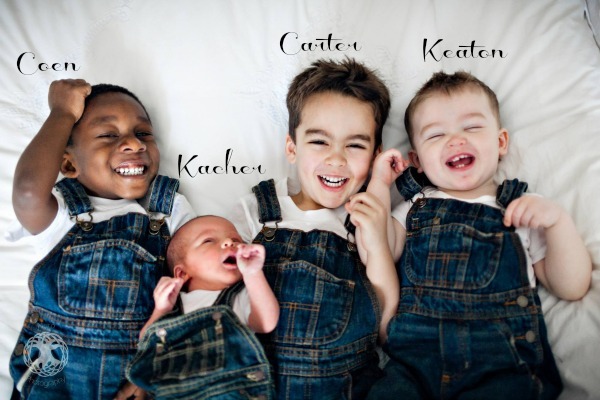 I’m blessed to be a stay-at-home-mom to 4 sweet boys ages 5, 4, 1 and newborn. If you’re like most people, you are thinking (or even saying out loud) “Wow! 4 boys 5 and under!” Yep. Me too. We are thrilled to have our boys so close in age, but some days, I just need a break from living in this frat house. I get relief from crafty projects and updates I do throughout our home on as little money as possible. You’ll find just about everything in our home was purchased at garage sales which makes it a little easier to relax as my kids tear through the house. I’m married to my best friend who supports me in everything and is an amazing role model to our hopefully-one-day-gentlemen. We get lots of questions about adoption and our process adopting our son from Ghana. We are happy to share information about the process with anyone interested (we kindly ask that you keep questions about his personal history/background to yourself. It’s not our history to share, it’s his). Check out the adoption link to see the blog we kept during the process and get answers to our most commonly asked questions. I hope you find something on this site that peaks your interest and please, jump in and share your thoughts. I’m always looking for great ideas whether they be fun activities for my toddlers, how to upgrade your home on a budget or what I SHOULD be wearing (’cause you know some days as a mama you’re lucky to get that shower! ).